Just the thought of Aruba congers up visions of an island paradise replete with beautiful water scenes and island living chock full of fun activities. There is no end to what you can do in Aruba. The island is the perfect vacation spot for anyone who is active or just wants to relax. There are plenty of activities for both those states of mind. You can fill your day with cool and fun excursions or just sit by the hotel pool or beach and veg out for your entire vacation. Whatever your pleasure you will be well taken care of in Aruba. Just the water activities alone can boggle the mind. Aruba’s sparkling coastline is just screaming out to be taken advantage of. There are sailing excursions by day or by hour, scuba diving, jet skiing and all manner of water sports to partake in. It doesn’t matter what age you are either. There are water activities for young and not so young alike. You can go fishing while the kids play in the pool or at the beach. 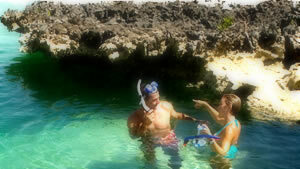 Or maybe a little snorkeling with the kids could be in order. There are guides to teach you what to do and where to go. If water isn’t your thing there are plenty of terrestrial activities to be had in Aruba as well. You can take a guided tour of the island and get your bearings on where everything is. Or, you can check out the terrain on any assortment of ATV’s. There are bird watching excursions and nature tours. There are guided tours for mountain bikers, or if you choose you can just go it alone. There are plenty of museum and galleries to check out all over the island. And even though it is technically not a terrestrial activity you can do a submarine tour. Add to that a tour of archaeological sites and you have a perfect vacation. Whether on land or sea the activities abound in Aruba. The island exudes romance too. You can take some salsa lessons and enjoy a romantic evening out on the town dining and dancing. Maybe even take a moonlight cruise. For those who want to keep up with their fitness routine, you can always find gyms sporting the latest in fitness equipment complete with racquetball and basketball courts. There is no end to all the activities you can on the island.